This is the second best Brown Ale that I have reviewed following only the Sebago Brewing Boathouse Brown and comparing the 2 probably is not fair as I had the Sebago on draft after a great day of golf and this one from a bottle after a long day of work. The only downside to this one is the color as it does not look like your typical brown ale. Aroma, taste, head are all great and it leaves a nice lace on the glass. I have been very impressed with Smuttynose and will have to find some of the beer on tap in the near future. Brewers Description: Winner of a Silver Medal at the 1989 Great American Beer Festival. 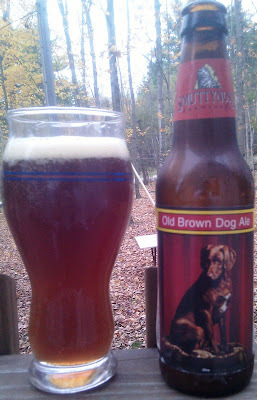 AWARDED BEST BROWN ALE IN THE NORTHEAST – 8th Annual US Beer Tasting Championship Old Brown Dog has been cited as a classic example of the “American Brown Ale” style of beer. Compared to a typical English Brown Ale, Old Brown Dog is fuller-bodied and more strongly hopped. Old Brown Dog has been around for many years. It was first brewed in 1988 at the Northampton Brewery. In 1989 it won a silver medal in its category (American Brown Ale) at the Great American Beer Festival in Denver.